There are three options available to input the data to the program. The first two options both use Comma Separated Value files to input data. These are tabular files that can be edited with Excel and a variety of other programs. Each file has a time column, followed by a column for each well or culture with a reading at that time. They differ in how the Date/Time value is entered. 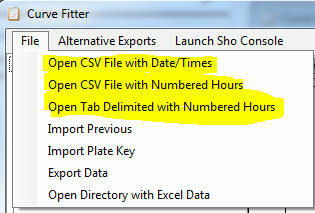 In the first option “Open Directory with Excel Data” the time is entered in a very specific date/time format. Such as: “5/25/2012 2:18:07 PM. In the second option, “Open File with Numbered Hours.” The time is simply entered as hours from the start, e.g. 0, 1, 2 etc. In practice, the easiest thing to do is download an example data file and simply change it to match your data. Any problems loading the data are likely due to either the date/time format being incorrect, or the CSV file containing empty lines at the end of the file (this can be checked for by opening the file in an editor such as notepad and scrolling to the bottom, any lines with only commas should be deleted from the file. Note for Europeans: Because France and Spain denotes decimals with commas, it is better to use a tab delimited file (option: "Open Tab delimited with Numbered Hours"). See the example file: TabDelimitedNumericForEurope.csv as a format guide.